Hang on to your office chairs (or couches) folks, this one is going to be a doozy. A little Wikipedia research, lots of pictures, subpar detail, and little understanding of what people who aren’t me consider amusing. 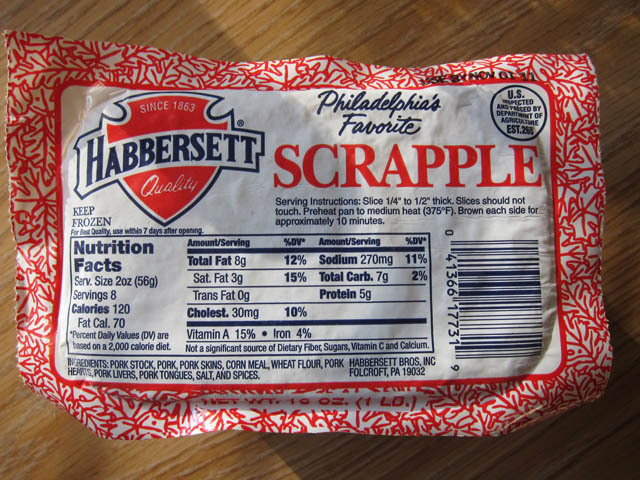 Scrapple is a common breakfast item at the deli case and diners in most of the NJ-Pennsylvania area, but that doesn’t mean it’s common to eat it. The name is effing horrible. Pop Ryan introduced this breakfast meat to me and I love it dearly to this day. Its got the best parts of crispy fried polenta and breakfast sausage. So, basically, it’s the perfect food. 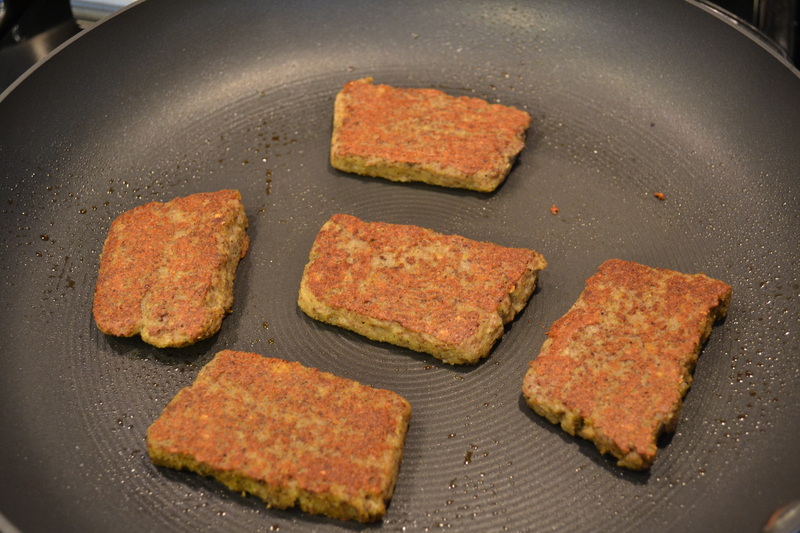 In addition to my love of the flavor and texture, scrapple fits in with my overall dislike of wasting food and my love of using everything. It’s a food item born out of the need to make use of all parts of the pig and ended up successfully turning some harsh tasting parts into something tasty. I hadn’t given a ton of thought to making it myself until recently, mainly because the packaged stuff is so delicious and they carry it at my JP grocery store. 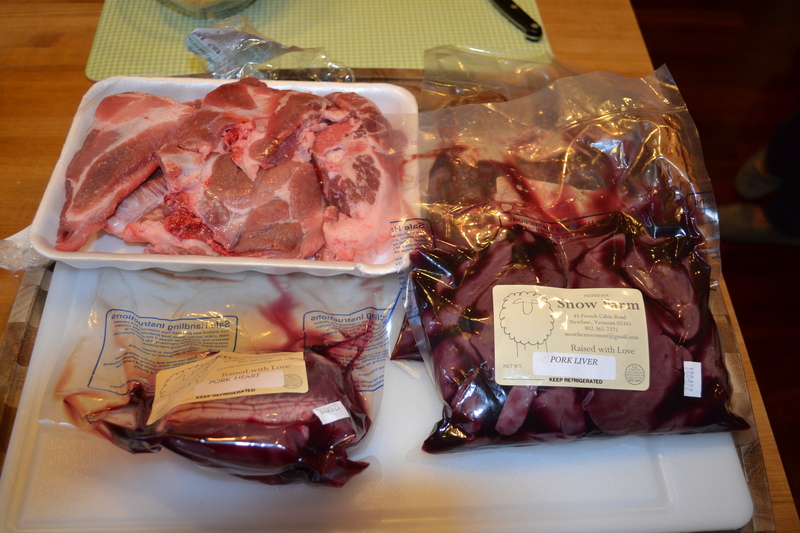 But when regular blog contributor David from Snow Farm offered me some offal from his naturally raised pork, I knew I would have to give it a shot. That’s one pig heart, a couple pounds of pork liver, and pound and a half of neck bones. Neck bones are funky looking but they’ve got a lot of meat on them. Plus, when you compare their appearance to the other ingredients they probably feel like the prom queen. 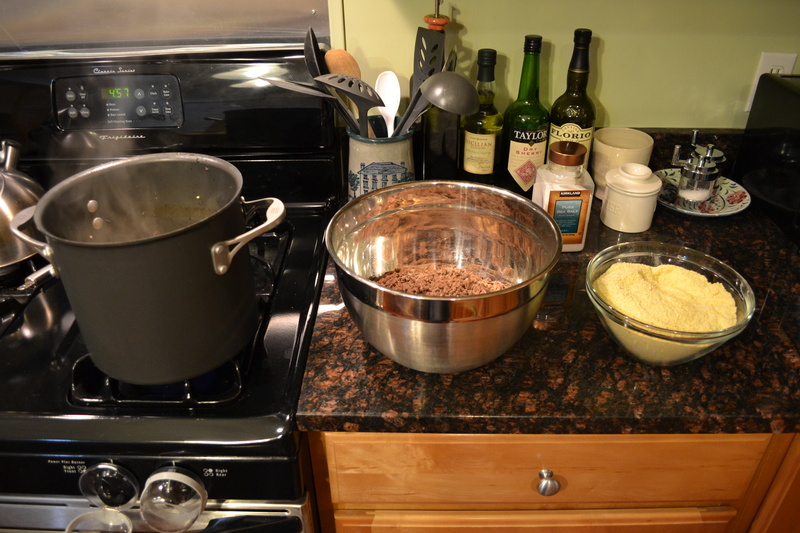 The idea is that everything goes into a pot, boils for while, then is ground up and combined with cornmeal and the cooking liquid to make a mush. Mush is poured into loaf pans, sets, then you slice it and fry it. Again, sounds completely up my alley. Amazing that I am nearing my 100th post and I’ve never done this before. 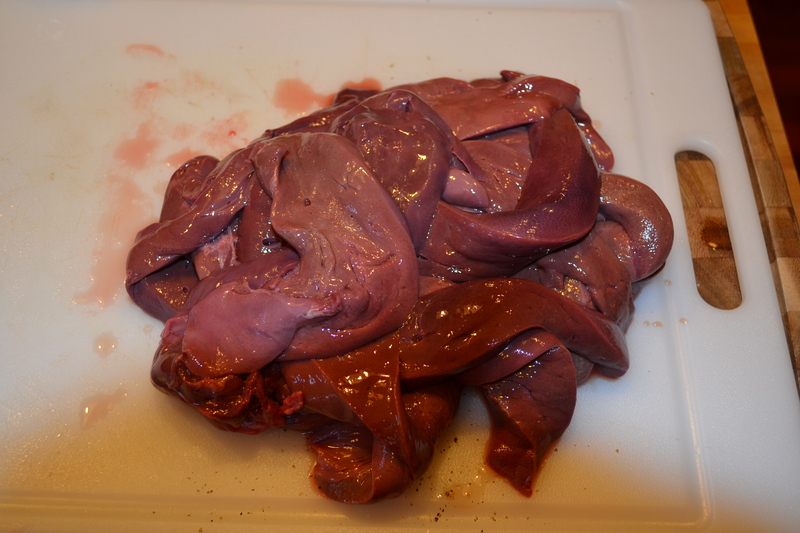 I’ve covered hearts and neckbones on this blog previously, but lets take another look at that sliced pig liver. The thing I was most surprised by with the liver was how non-offensive it smelled. 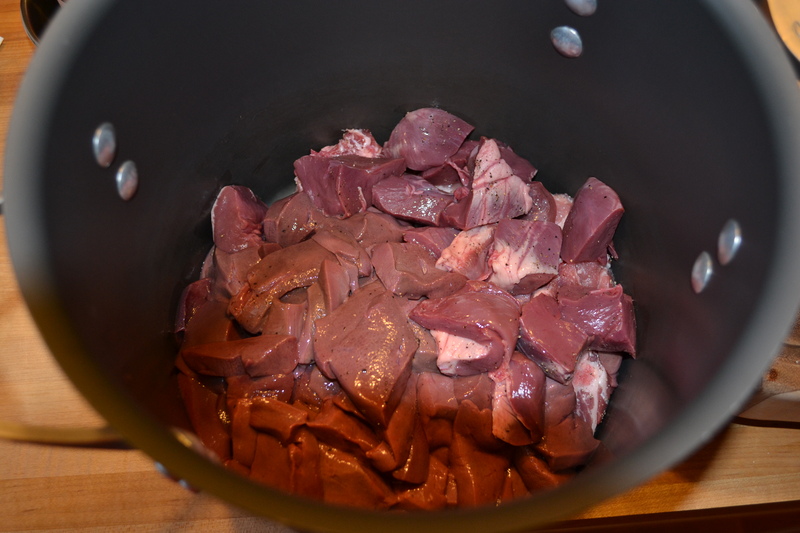 I’ve cooked some grocery store offal and without fail it always smells like the inside of an animal. This smelled like cold roast beef when I opened the package, truly surprising. Glad I held out for the good stuff before attempting this one. I sliced the heart and liver into cubes, seasoned with salt and pepper, and threw everything into a stock pot along with the neck bones. My instinct was to cover this with water and boil it, but I realized that it might be tough to get the liquid vs. cornmeal proportions right without measuring. You know, since I had no concept of what consistency hot liver mush should be before it’s cooled. So, I went against my strong moral fiber and referenced a few recipes before deciding on 12 cups of water over the meat. I brought the whole pot to a simmer on the stovetop, skimmed off some junk and left it to cook for a few hours. After three hours of fluctuating between a simmer and a boil with the lid partially on, the meat started separating from the neck bones and everything looked pretty well done. 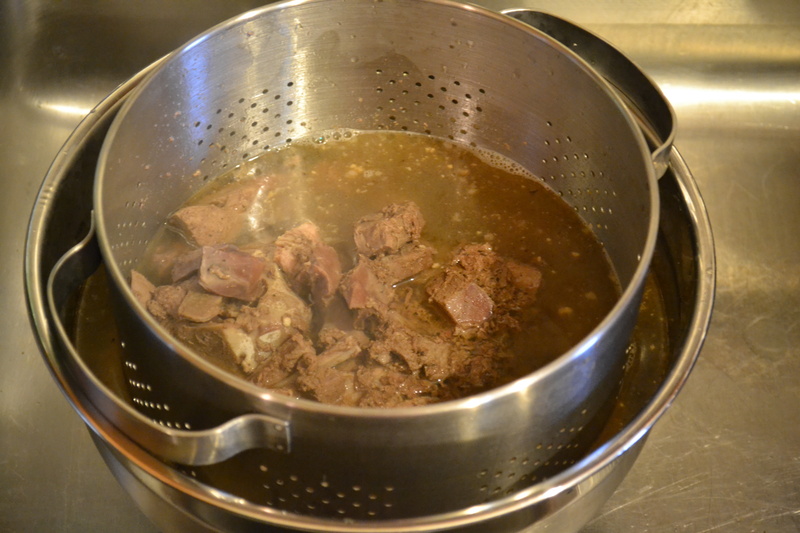 The stock pot was dumped into a strainer inside a bowl to make sure I didn’t lose any of the cooking liquid. This was a good step for me. 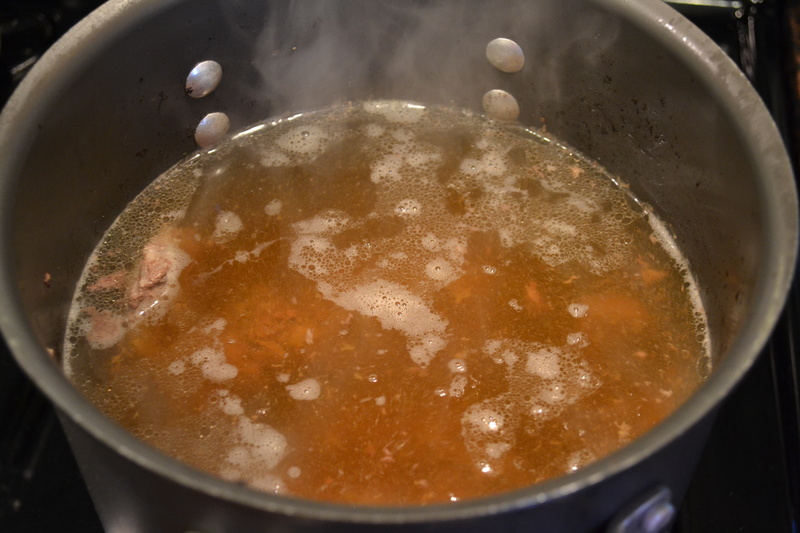 Usually I would burn my hands and dump half the meat and broth down the drain by accident. This time around I acted super mature and used a giant bowl and a colander from Ikea. Didn’t lose nothin! 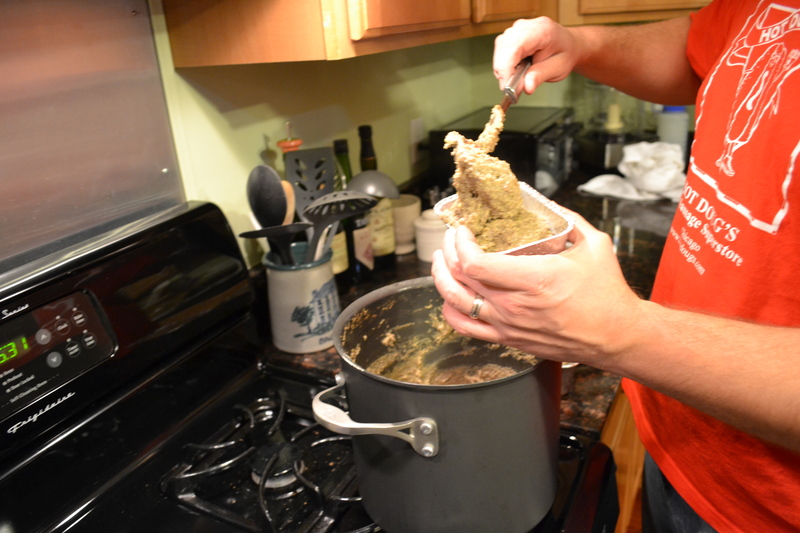 The cooking liquid was reserved in the original stockpot and the questionable, unattractive, super-sketchy-looking gray organ meat went into a large bowl for sorting. This picture could have been added to 5 or 6 different posts with the stuff I’ve cooked. Boiled meat looks foul all the time, which is how I defend my appearance in hot tubs. Wokka wokka, here all week folks! Sorting was slightly trickier than expected. 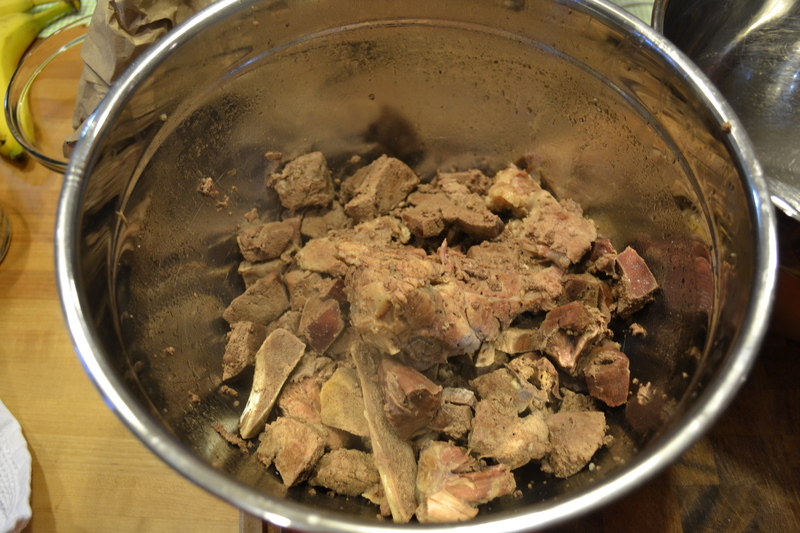 As it turns out, boiled liver is very firm and resembles pork neck bones. You must be dying to cook it yourself at home. Anyway, the visual similarities meant that I had to pick through and attempt to break every piece of liver/bone to figure out whether it should be kept or thrown away. Didn’t take too long, but got some good finger burns. 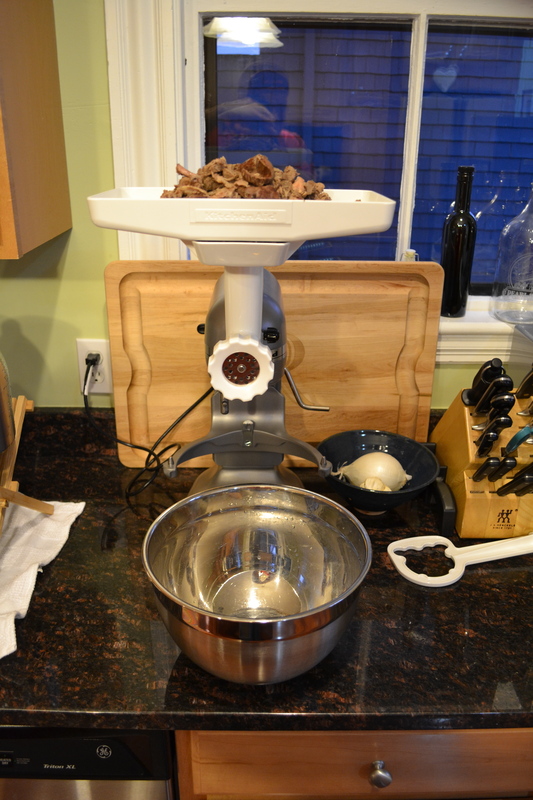 Once everything was sorted into “meat” and “trash”, I piled it all into the tray on the grinding attachment for my Kitchenaid mixer. 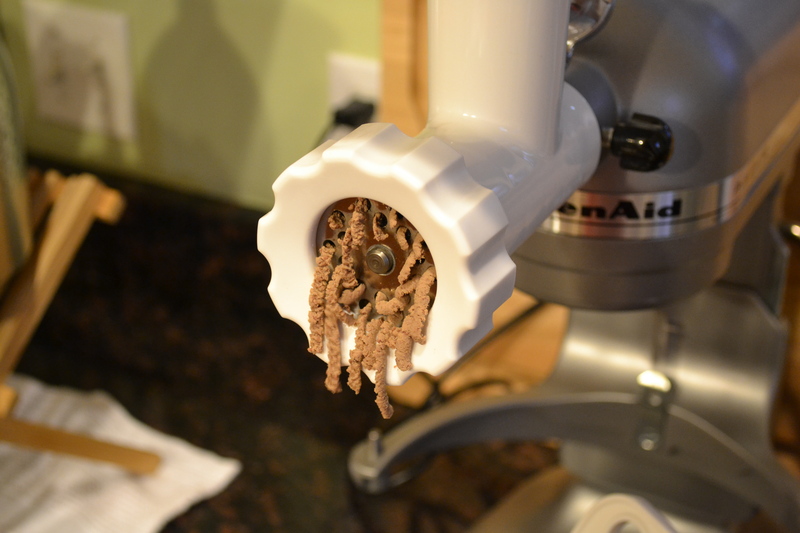 The grinder attachment is incredibly simple once you get the hang of not overloading it by pushing too much stuff in at one time. I had it setup with the fine grinder attachment since I wanted the heart/liver/meat to not stand out in the final products; just have one consistency throughout. Which made for a relatively unattractive ground product. While I dealt with the trials and tribulations of meat grinding (read: meat grinder jams caused by impatient forcing into the grinder from an ADD 32 year old), the cooking liquid heated on the stove top. 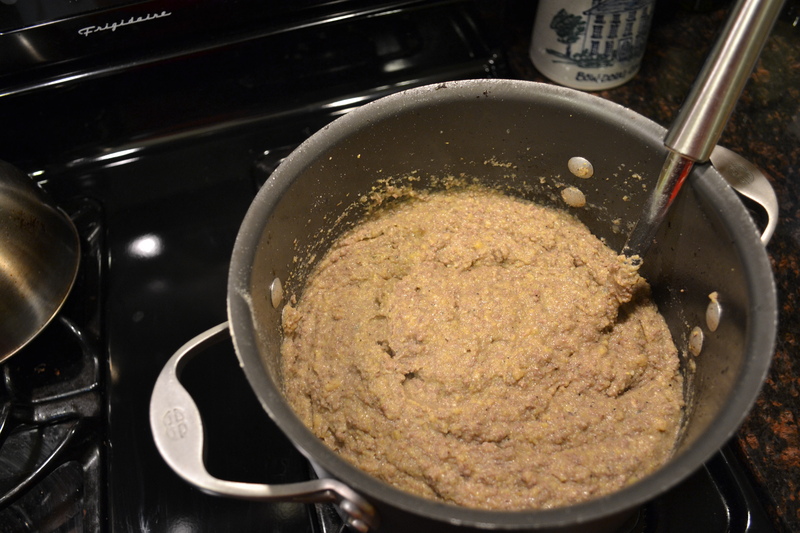 Once I had the full pile of meaty Play-Doh noodles, I got setup for combining everything into an offal porridge that magically turns to scrapple as it cools. We started with three quarts of liquid and most of the boiling was at least partially lid-on so not much liquid cooked off. That got paired with 4 cups of corn meal, a couple tablespoons of sea salt, a couple tablespoons of black pepper, and a mix of onion powder, garlic powder, dried thyme, and nutmeg. The dry ingredients get stirred into the reserved cooking liquid in small waves, then the heart/liver/meat mixture is added at the end. Got it? 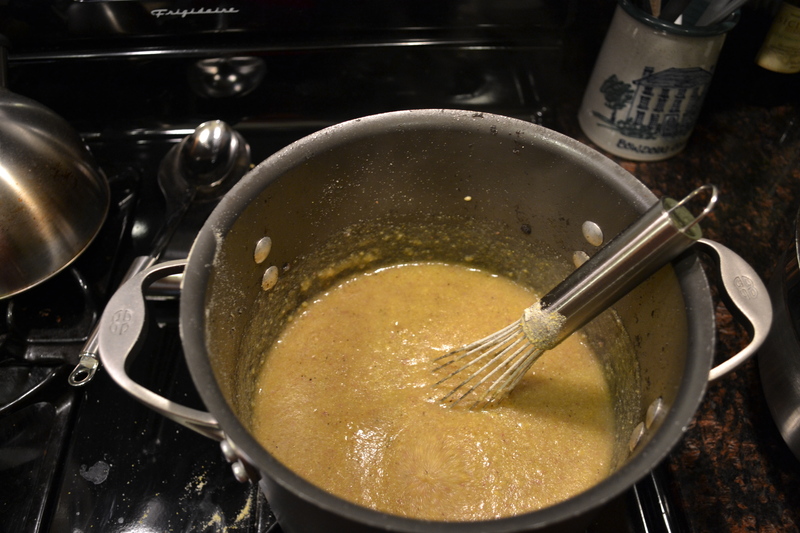 In order to avoid huge clumps of corn meal, I used a whisk early on. Once the mixture reached about the thickness shown, I switched from the whisk to a large spoon since it was similar to stirring cement at this point. Had to be stirred constantly, especially as the additional corn meal and meat went in, but also to keep it from burning during the 30 minutes everything cooked together. “Whoa, you gonna eat all that hog organ mush? I got a spoon and some tupperware, just let me know!” – Nobody I have met. Y’all know anybody? Once thirty minutes had elapsed, and I was counting minutes like an 4th grader in Sunday School, I had a burning forearm and a lot of organ stank in my clothes. 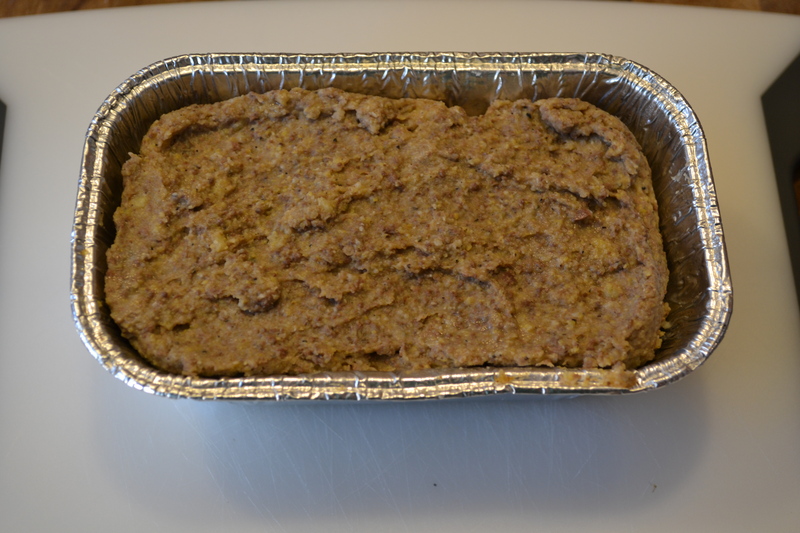 I also had a completed batch of scrapple ready to be poured into molds to set. Thankfully, Kristi returned from her self imposed exile (it was a hair appointment, cry me a friggin river) to take some action shots. The mixture went into more loaf pans than I had expected, but I was well stocked thanks to a grocery run by Kristi. I sprayed the inside of each pan with some cooking spray, which would make it easier to remove the loaves once they set. It also led to lots of awkward spooning and attempts to smooth the surface with more sticking to the spoon than staying in the pan. The action shots of this process are probably not enthralling to the casual reader, and there are a ton of images in here already, so let’s skip to the end. After the loaves cooled to room temperature, I wrapped each with a layer of tin foil and sent them into the fridge overnight to set. I was extremely excited, nervous, and hungry all at the same time, but the required wait until the following morning was relatively pleasant since I’d tasted it too much during the process. Needed a little break from hot liver paste. The next morning, I pulled my first loaf out of the fridge. The easiest part is removing it from the pan. Just flip it over and tap the bottom a bit to get the loaf to release onto the cutting board. It was pretty exciting to see it pop out in whole-loaf form, just because it looked like the “real thing”. To fry it, I put a pan on the stovetop over medium/high heat since the pan has to be very hot to avoid scrapple sticking to it. From there I cut some quarter inch slices off the loaf. Once the pan was good and hot, the slices went in after a quick spray of Pam. 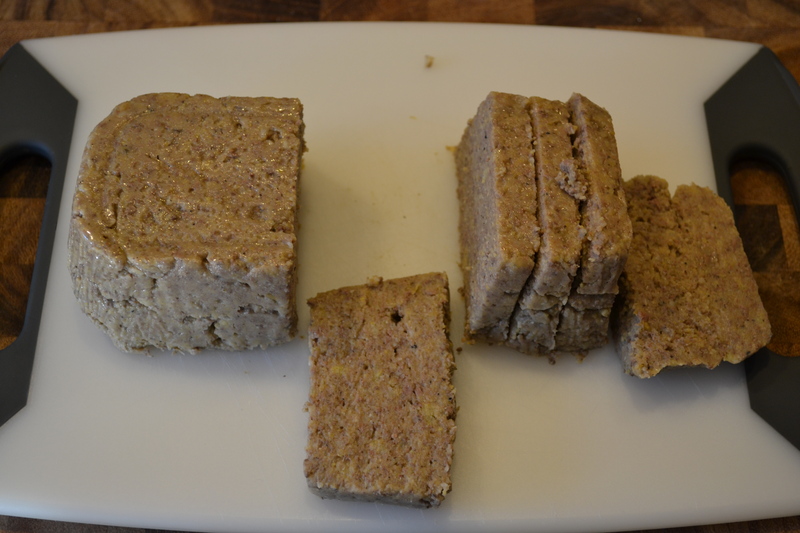 This scrapple lived up to it’s store bought namesake with the added benefit of knowing everything that went into it. With any scrapple, the first flavor you get is black pepper, almost to a spicy level which is what you got from this one. The pepper is complimented with a strong pork sausage flavor and some hints of liver along the way. The best and most unique part, though, is the consistency. The outside is potato chip crispy (if cooked right) and the inside has the softer consistency of polenta. Great stuff, and makes use of everything on the hog, not just the pretty cuts. 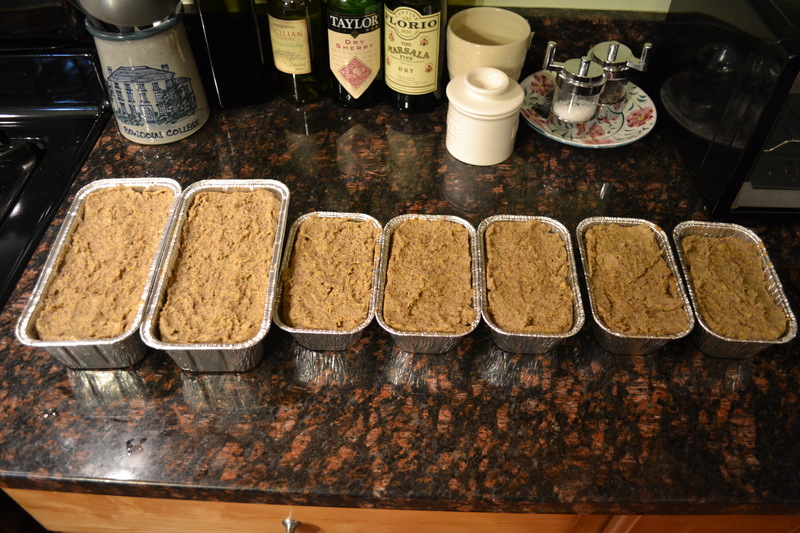 The rest of the 7 loaves were vacuum sealed and went into the chest freezer for plenty of meals over the next year. Definitely a meat that freezes well. Hope everyone had a great Thanksgiving. I ate too much. Have a couple possible posts from the week though.